At the heart of Christie’s campaign is a plan to drive a wedge between state workers and middle-class taxpayers. Governor Chris Christie entered yesterday town hall meeting in Ocean City, New Jersey, by passing through a phalanx of scores of angry protesters, at least a few of whom confronted Christie up close. Under brilliant sunshine just steps from the Atlantic Ocean, protesters—along with gawkers in bathing suits—greeted the governor with a cacophony of chants and signs. Among them were Atlantic City casino workers, thousands of whom are slated to laid off in the next weeks as three more casinos shut down; teachers and state workers demanding that Christie fully fund their pension plan; environmentalists opposed to Christie’s plan to build a natural gas pipeline through the pristine Pinelands National Reserve; and others. Entering the town meeting, at the Ocean City Music Pier, Christie threaded his way through the crowd, mostly avoiding the protesters while posing for selfies with admirers, including a pair of teen beauty queens wearing tiaras. Inside, before a crowd of about 600 people—including many Christie admirers, Republican officials and elected GOP office-holders—the beleaguered governor entered to a standing ovation. And, in prepared remarks and a lengthy Q&A session, Christie tiptoed a bit closer to an announcement of his 2016 presidential bid, coupling that with his tough-guy denunciations of greedy public employees for what Christie calls their unreasonable demands for equity and for getting what they’ve bargained for, especially in pension and healthcare benefits. His scare tactics aren’t working, at least in New Jersey. As The Record, a New Jersey daily, points out, Jersey voters overwhelmingly oppose Christie’s cuts to pensions and other benefits, by a stunning margin of 53-24. (“I don’t care!”) In addition, The Record reported, 53 percent of New Jerseyans support raising taxes as part of a package to fix the shortfall in pension solvency. But that doesn’t matter to Christie, who’s given up on appealing to his New Jersey constituency, instead focusing now on GOP primary voters and caucus-goers in Iowa, New Hampshire, South Carolina and Nevada. I get this health plan now. And I have to tell you the truth, it’s embarrassing. I go to the pharmacy to pick up a prescription for one of my kids and you know what I pay most of the time? Three dollars. Three dollars for anything. And the guy behind the counter is looking at me, knowing he’s paying for me to get that. I’m embarrassed by that. It’s too rich. We can’t afford it. Of course, nothing is free: but often underpaid state workers, including teachers, pay a lot as their share of New Jersey’s healthcare plan, and in 2011 Christie pushed through legislation that forced state workers to pay a lot more for pensions and healthcare. Now, what was once a great victory, achieved over vigorous protests and demonstrations by thousands of state employees on the steps of the capitol building in Trenton, isn’t good enough, and Christie wants more. 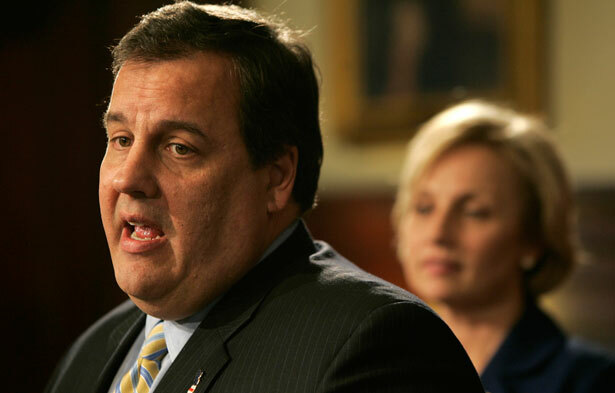 As Christie Watch has reported lately, Christie is gaining momentum for 2016, ticking up in polls and trying hard to put Bridgegate and related scandals behind him. (During yesterday’s town hall meeting, he didn’t get a single question from anyone about any of the scandals, nor about the controversy over how Christie’s administration mishandled recovery aid from Sandy.) In one recent poll, he was just six points behind Hillary Clinton.